Winter couldn’t be more fun – in The Lake George Area in New York’s Adirondacks! Lake George, N.Y. - Experience winter snowfall - in its countless variations - at one outstanding vacation destination - The Lake George Area in New York&apos;s Adirondacks. Grab a lift ticket and carve some trails at three challenging downhill ski areas featuring terrain parks, glades and cruisers, steep verticals, night skiing and of course, snow tubing! Traverse the scenic back country on snowmobile, snowshoes or cross-country skis. Skate, slide or experience a horse drawn sleigh ride. Warm up indoors with art and local history museums, boutique, antique or outlet shopping, sports, dining, entertainment and spas. The Lake George Area in New York&apos;s Adirondacks is an easy-to-reach, affordable, year round vacation destination for the whole family. 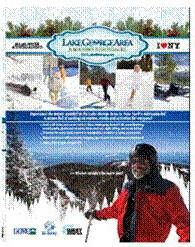 For free information on lodging, camping, dining, recreation, events and activities, 800-365-1050 X5100 or http://www.visitlakegeorge.com/ Four great seasons - one out standing destination!